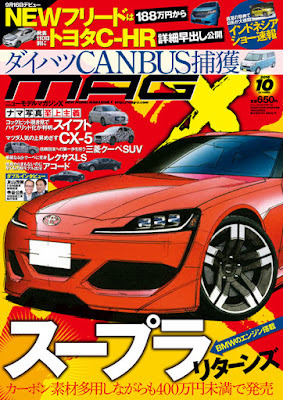 日本自動車デザインコーナー 「Japanese Car Design Corner」: New Toyota Supra is finally coming in 2019...?! New Toyota Supra is finally coming in 2019...?! 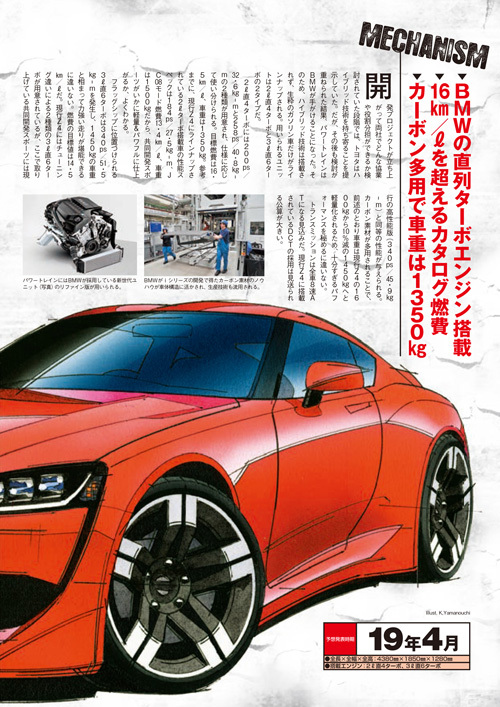 A Supra successor is an ongoing story at least since 2010 (earlier post), but it may actually happen after all. It's not a secret that Toyota is working with BMW for the development of a sports car, but no one knows what kind of car it will be. With Toyota already having the 86 in its lineup (earlier post), due for replacement in 2020, the collaboration between the two companies would make sense if Toyota would introduce another sports car, bigger than the 86. According to the information published by Mag-X, the new Supra will be launched in April 2019. Power will come from a turbocharged petrol engine, despite the fact that at the beginning of the project, Toyota's hybrid technology was considered. The new Supra will be fitted with a 4-cylinder 2.0L engine, as well as a 6-cylinder 3.0L engine. The 2.0L engine is likely to come in two versions, one producing 200 ps / 32.6 kgm and the other one with an output of 258 ps / 40.8 kgm. The targeted fuel economy is 16.5 km/L. This will be possible due to the low weight of 1,350 kg, thanks to the use of carbon fibre.The price is expected to be below 4,000,000 ¥ (around $40,000).